Another PDQ - Bolon collaboration! 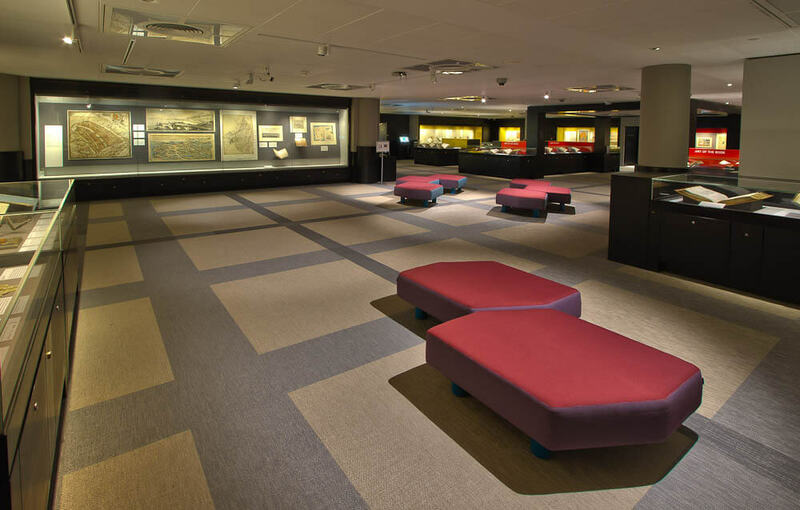 This time PDQ were instructed to install Bolon tiles to the 'Treasures Room' at the British Library. A detailed drawing showing specific gridlines was sent to us to calculate the most cost effective way of creating the desired effect. It was decided that Bolon tiles onto a sound isolating underlay would be the best way forward. With 9 full tiles for the larger squares framed by a full tile border and half tile lines running through the entire floor the desired effect was achieved and looks amazing. Working closely with the British Library's installation & refurbishment team to ensure the area was shut down for the minimum period of time. Existing carpet tiles had to be uplifted & removed from site for recycling, floor preparation then had to be carried out working around other trades, we could then proceed with the Bolon and underlay installation. The room was transformed by removing the old, dark carpet tiles and installing this simple but clever design using standard 'off the shelf' tiles. Going to show that 'bespoke' solutions don't have to cost a fortune. © 2019 PDQ Contract Flooring All Rights Reserved.